One of the big reasons we were all excited to see Captain America: Civil War was the first Marvel Cinematic Universe appearance of Spider-Man. 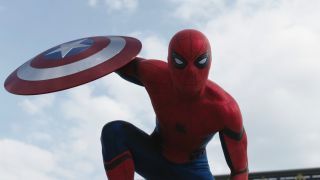 Tom Holland made the most of his limited screen time as his version of the webhead was one of Civil War's many highlights, and with Spider-Man's own solo film coming out next year Chris Evans would love to return the favour with a Captain America cameo. Captain America and Spider-Man don't really interact with each other all that much in Civil War, but when they do it's fantastic. As great as it would be to see that relationship develop, I have a hard time believing Cap will show up in Spider-Man: Homecoming. For one thing, that film already has Robert Downey Jr's Iron Man showing up, and you don't put Downey Jr in a movie unless your planning on giving him a decent amount of screen time. And while having a bunch of heroes worked for Civil War, the presence of both Cap and Iron Man in Spider-Man's first MCU movie may prove a little too distracting. Still, there's a good chance that Civil War won't be the last time Steve Rodgers and Peter Parker touch base on the big screen. Directed by Joe Russo and Anthony Russo, and starring Chris Evans, Robert Downey, Jr., Scarlett Johansson, Chadwick Boseman, Tom Holland, Anthony Mackie, and Sebastian Stan, Captain America: Civil War is out in UK cinemas now and opens on May 6, 2016 in the US.